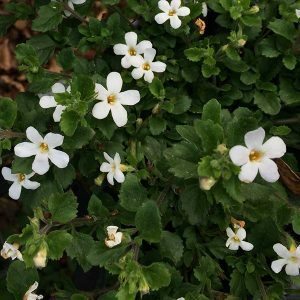 Ground cover plants are always in demand, Sutera cordata (syn Bacopa) ‘Starlight’ has a reasonably tidy habit, is long flowering and easy care, all great attributes. It will form a dense ground hugging mat, which makes it great for suppressing weeds as well as helping retain moisture in the soil. This is an evergreen plant, originally from South Africa. Small mid green foliage and masses of white flowers from spring right through until autumn make it a year round plant. It has a naturally trailing habit, this makes it well suited for use along the top of low retaining walls as well as in hanging baskets. Sutera cordata Starlight will form a mound to around 12 cm in height and spread to cover 40 – 50 cm. In warm to temperate climates it is evergreen as well. This is a plant that is best grown in a humus rich well drained soil, Sutera cordata Starlight grows well in part shade to full sun. When first planting, dig in some well rotted organic matter and then water in the plant with a liquid seaweed fertiliser. Once established, this is a plant that is relatively drought tolerant. During long dry spells, a little additional water may be required. A general purpose slow release type fertiliser in spring will help promote strong new growth. You can prune back lightly at the end of the flowering season or in winter, to help maintain a good bushy habit.